It has been wonderful journey through this marvellous cuisine……. The distinctive taste of Mappila Cuisine has been heavily influenced by the faraway traders, from various countries like Portuguese, British, Dutch, Chinese, French, Arabs, etc., who regularly visited this region…….. Arab influence on this cuisine is more pronounced……. Other than the recipes I have written about there are so many wonderful recipes that I must mention here……. Puttu : This is made throughout Kerala…… These are steamed, cylindrical, coarsely ground rice flour & grated coconut cakes……. Mappila speciality is that Puttu is layered with seafood/meat. Pathiri : These are rice flat breads……. Pathiris are served on special occasions & are served with meat curry. Muttasirka : This is another Malabar delicacy which is served with spicy scrambled eggs & meat curries. Arikadukka : Mussels are stuffed with an aromatic rice & coconut mixture…… Marinated in a spicy batter……. & finally deep fried. Koondal Kadaku Phokuvadu : Masala squid & mussels. Chemeen Porichattu : Marinated prawn fry. Chattipathiri : This is made in both sweet & savoury variations …… These are baked, layered flatbreads with rich filling, very similar to Italian Lasagne. There are many more such wonderful recipes. Thus, in this way, the legacy of the sea faring traders from ancient times continues to live on in this exotic cuisine of Malabar region – MAPPILA CUISINE. Historically, it is said that Prophet Mohammed drank this tea with black pepper and dates added to it…… Later Arabs made slight changes like adding sugar to the tea, called it Sulaimani, and continued the tradition of drinking it. INGREDIENTS : 1/2 – 1 tsp tea leaves (depending on the strength of the tea leaves used), 2 cups water, 3-4 tsp sugar (or according to taste), fresh lemon juice – according the taste. DIRECTIONS : Boil water in a pan….. Add tea leaves, cover and immediately turn off the flame….. Brew for 3-5 mins according to taste….. Strain the tea into cups….. Serve hot with sugar & lemon juice. NOTE : For variations, one can use various spices like cardamom/ cinnamon/ mint/grated ginger either alone or in various combinations……. But must use the spices in very little quantities so that the flavour of the tea is not overpowered…… Also instead of sugar, jaggery/honey can be used. 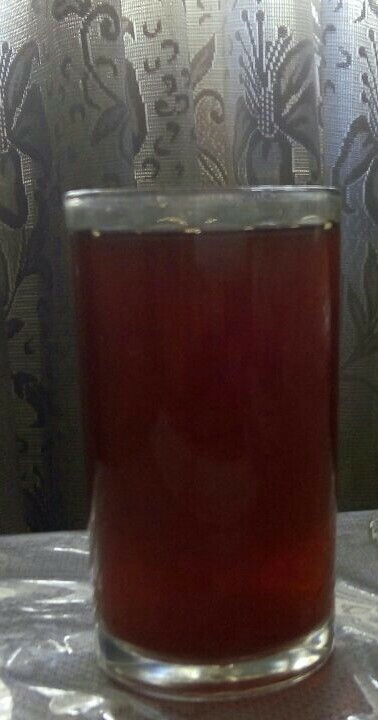 This is medicated herbal water which, in Kerala, is preferred instead of water with Biriyani or any rich food……. Dahasamani promotes easy digestion, is a natural thirst reliever, is excellent for cooling the body & purifies blood…….. It is usually available in local markets……. It is prepared by mixing dry ginger, coriander seeds, cloves, cardamom, sandalwood, puncture vine, vetiver, mimosa catechu, sapanwood. This mixture of herbs is added to drinking water……. Boil 5 litres of water in a pan…… Add 1 tsp of Dahasamani….. Boil away….. The herbs bestows a beautiful deep pink colour to the water…….. Remove from heat……. Strain……. This can be drunk throughout the day. If the mixture contains sapanwood (pathimukham) more, then the resultant drink is attractive pink…..
And if the mixture contains mimosas catechu (karingali) more, then the resultant drink is brownish colour….. NOTE : The said importance of the ingredients ……. Dry ginger (Chukku – in Malyalam) : Lowers cholesterol….. Helps to relieve diarrhoea, stomachache, flatulence, indigestion, etc. Coriander seeds (Malli) : Helps in improving indigestion, flatulence, diarrhoea…… Controls bad cholesterol, blood sugar….. Assists digestion, etc. Cloves (Grambu) : Heals tooth decay & bad breath …… Used for treating digestive & respiratory disorders, etc. Cardamom (Elakka) : Aids digestion….. Cures digestive disorders, etc. Sandalwood (Candanam) : Being a coolant, it is very useful in gastritis…… Relieves burning sensation in hands & feet……. Used as an antiseptic, etc. Puncture vine (Njerinjil) : Used as diuretic, aphrodisiac…… Aids in relieving nerve disorders…. Soothes nerves….. Purifies blood….. Provides relief from acidity, constipation, etc. Vetiver (Ramacham) : Used for making medicated drinking water which aids digestion….. Purifies blood….. Relieves excessive sweating……. Removes bad body odour …… Helps relieve stress, etc. Mimosa catechu (Karingali) : Used for treatment of sore throat, diarrhoea, etc. Sapanwood (Pathimukham) : Helps in quenching thirst….. Is antioxidant, antibacterial, diuretic….. Purifies blood….. Cures respiratory ailments, jaundice,etc.